On Thursday I attended the Eltham North Ward Panel meeting which is held quarterly by the local police. This meeting was well attended, probably because of the rise in burglaries in Eltham which the police have struggled to stem. 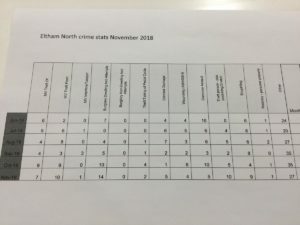 Although there were a lot of other items on the agenda and our local police team are obviously working really hard, the hard figures circulated at the meeting showed the way the burglary issue had grown in recent months – from 0 in July to 14 in November (although the month hadn’t finished at that point). For me the most depressing part of the meeting was that the local officers were quite happy to help advise people how to secure their own homes, but without more resources (like a car) it was extremely hard for them to combat a well organised, potentially violent gang who were in and out of houses quickly and used a getaway car with false number plates. As a Councillor I remain of the opinion that working with others regardless of party to improve the Borough is the best way of getting things done (especially in opposition) but in this case, I want to make clear my feeling that the reorganisation of London’s Police under the Mayor is clearly having an impact on what can be achieved locally. Losing our Police Station is a mistake which our Council, our GLA member and our MP should be fighting but they simply aren’t making enough of an effort. Blaming the government is easy (and I am sure they have done things wrong) but the Mayor of London needs to step up and take responsibility. The stories told by residents at our local police meeting were frightening and it can’t be right for the only police response to people’s doors being kicked in to be to offer some advice about how to secure your home. We need more police on our streets, an open police station and a plan for dealing with these burglars – I’ll be writing to the Borough Commander to ask what he can do, but the politicians in charge need to hear that what is happening at the moment isn’t working and give our police the resources they need to do their jobs properly. Spencer has been one of the three Councillors for Eltham North Ward since 2002. He is currently one of two Conservative Councillors for Eltham North, being joined by Charlie Davis following a by-election in November 2016. Born in Woolwich, Spencer is a married father of two teenage children who lives on the Eltham side of Shooters Hill. Spencer was first elected to Council in 2002 and has served on Greenwich Council as a Councillor for Eltham North ward since that time. He has worked with a range of excellent fellow Councillors over that period including Dermot Poston, Douglas Ellison, Nigel Fletcher and Charlie Davis. Spencer was Deputy Leader of the Opposition from 2004 to 2006 and Leader of the Opposition from 2006 to 2015. Spencer is an active ward Councillor who has led many campaign locally including for the warm water pool to be included in the Eltham Centre and to restore free parking on western Glenlea Road. Spencer is a Trustee of Eltham United Charities (which provides free housing for older people in Eltham) and the Severndroog Castle Building Preservation Trust (which looks after Severndroog Castle). Spencer works at Colfe’s School in Lee where he is currently Director of Sixth Form. Good evening. You are right, the police are under resourced. They also have to deal with so many different types of crimes that the way they work is different. Local Safer Neighbourhood policing is policing on the ground and it’s their job to advise and support and give out the prevention message. They are not 1st reposnders. One of the best ways to help rather than moan about, as we all know the government is not to start reversing its cuts any time soon, is to build a safer and stronger community from within. Working in partnership with the police, starting a Neighbourhood Watch Scheme in your area is being more proactive. Looking out for your neighbours knowing their names and what’s going on with where you live puts you in the best position to know something isn’t right. You cannot expect police in every corner yet the intelligence you provide can be the missing link in an investigation that the police are doing. At least the plans don’t require any change to this building which means that the character of the area won’t be spoilt. Great turnout today. We had our #GLA candidate @CDavisEltham join us and found new members and plenty of support. Time for real opposition in #lewisham with @Eleanor_MRM for #evelyn.